At Swindon Barbell our members are our greatest asset, watching them train and develop is one of the great joys of being part of this club. Today we are taking a deeper look into our membership and what makes them tick! We begin with Mark Townend, the clubs own man mountain who is charging full steam into the Powerlifting scene. Mark started his sporting life with Rugby, playing at a very high level towards the end of his career. This gave him a drive and dedication to train hard and play harder, but also a fantastic foundation for strength sports. He came to Swindon Barbell in January 2018 and immediately found the same passion that he had enjoyed while on the pitch through his Rugby years for standing on the platform moving huge weights. In very little time he was training regularly and making huge strides in both strength and technique, which inspired him to enter the Swindon Barbell Bitesize competition in March. He came away from this, his first comp, with an ENORMOUS 520kg total, and the determination to do it again. 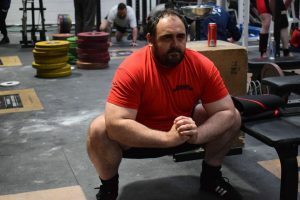 From the Bitesize he upped his training, learning as much as possible from coaches at Swindon Barbell, and entered the South West Open Championships with a view to qualifying for a much larger comp – the All England Masters Championships. Training hard paid off, and he easily qualified for the All England, walking way from that competition with a whopping 585kg total and a first place medal. Now, with a goal in mind and the competition approaching we at Swindon Barbell are all cheering him on. Qualifying for the Equipped Champs would be a huge step and, if he keeps this up we could see Mark making his way to much larger competitions in the future. With his dedication to consistent training, his incredible work ethic and Swindon Barbell standing behind him, Mark Townend is a man to watch in the comping competition season.